One of the most vexing conundrums in the chess is maintaining the balance of fairness in the royal game. This question has surfaced recently in federation meetings because of the pending Olympiad tournament in Dresden, Germany. Having just watched the historic Beijing Olympics back in August, we understand some of the problems in building a team representative of the best talent a country can offer. In chess, federations do this in different ways. Some use the National Championship as the qualifier. 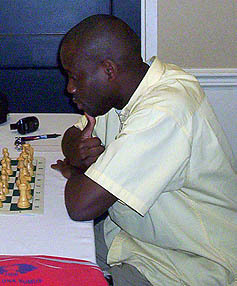 Others use a chess league or a specific tournament while others use ratings. Yet others may use seniority while others use an arbitrary rotating system. Some may use match play between top players. Recently a novel way has been attempted by the colossal nation of Nigeria. Instead of having their sizable Diaspora travel from all corners of the globe to play in Nigeria, they have staged qualifiers on three continents. This ambitious idea was agreed upon after lengthy dialogue and debate. When the idea was agreed upon, there was still skepticism on the execution of all three events. The three qualifying events were completed with a number of challenges, but the effort was admirable and can be deemed a success. Perhaps this is a model which can be used for those federations with a large expatriate community who would otherwise would not compete for their adopted country. This would eliminate the burden of nationals having to travel home only to compete in a tournament and take additional time from work and other responsibilities. Of course, the federation may argue that it is compulsory for players abroad to compete at the allotted time and place, but this may not be feasible in all cases. This is also a way to strengthen ties within the Diaspora and give players abroad a chance to represent their nation. One would also argue than expats are no less patriotic than those on native soil, but again the entire idea of transcontinental trials may be for players who have lived abroad for many years, yet would like a chance to represent their country. This is something we often see in the Olympics and in the World Cup soccer where players are sometimes selected on more nebulous criteria such as one grandparent being a native of a particular country. Perhaps this model is not perfect and most nations will continue to use their previous models. Few European federations will have to use this system, but for developing countries where nationals migrate for economic opportunities or schooling, it may be a model worth considering. See "2008 Nigerian Olympiad Qualifiers"